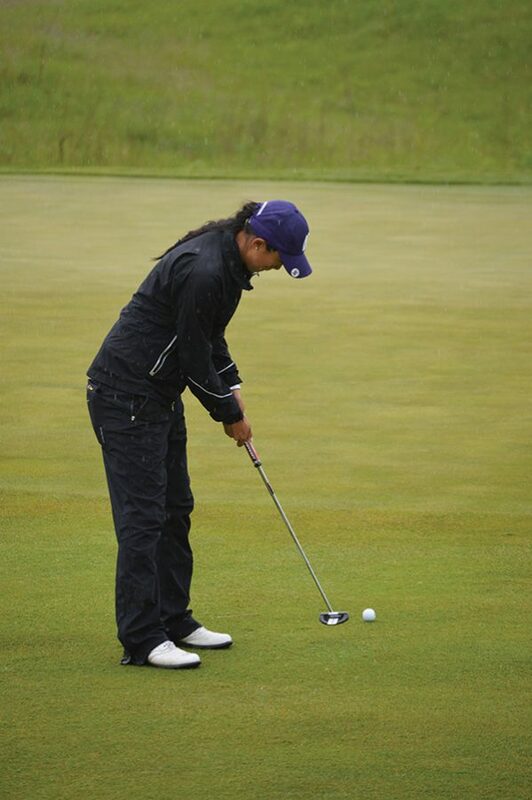 Janet Mao putts. The junior and the Wildcats will compete at the Stanford Intercollegiate beginning Monday. After a lackluster performance two weeks ago at the Windy City Collegiate Classic, Northwestern will look to bounce back at the Stanford Intercollegiate. The Wildcats were runners-up at the NCAA Tournament last year, but finished ninth of 15 in their most recent tournament. Coach Emily Fletcher said the team has a chance to show they have more to offer. NU will face stiff competition against an elite field that includes Stanford and Georgia. Due to renovations to the Cardinal’s usual golf course, the tournament will be played at Poppy Hills Golf Course in Pebble Beach, California. Senior Hannah Kim said the location change puts everyone on equal footing. Kim has attended the Stanford Intercollegiate every year since she arrived at NU. Junior Janet Mao said she looks forward to going to the West Coast after a disappointing home event. Kim and Mao said the past two weeks have allowed them to hone in on improvements after a rough start to the season. Kim said she tightened her swing, and Mao said she has worked with assistant coach Beth Miller to boost her play. Even so, the Cats will have to fight hard to assert their dominance. Fletcher said NU will need tournaments like this one to demonstrate its capabilities.